At the bottom of the electrical section of the Designer, click Add AC Wiring. This will open up a new menu where you can select AC conductors, define AC panels, and design transformers. 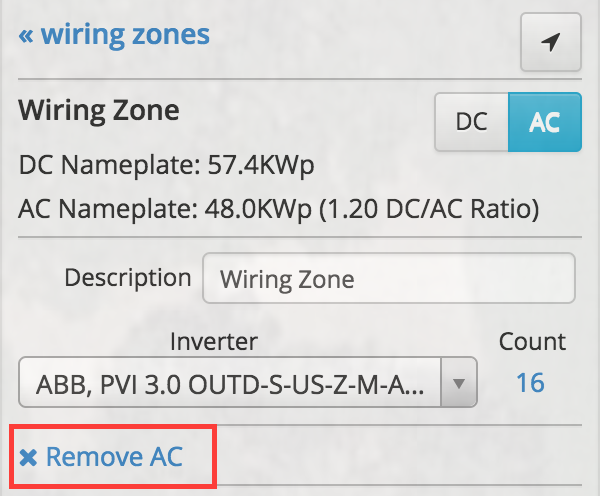 If you prefer to use the AC losses in the Condition Set, you can click Remove AC and the AC wiring will be removed from the electrical portion of the design. HelioScope will default to to the electrical losses in the condition set. Click the following link to learn more about AC Wiring.